Try our Baja Fish tacos recipe! A creamy blend of medium-heat smoky chipotle and mild, sweet ancho chili peppers. This ancho chipotle sauce offers an easy, convenient way to deliver new flavor experiences that will keep patrons coming back for more. No skilled labor or prep time is needed. These sauces are perfect for both hot and cold applications, and easier and more consistent than customizing condiment/dressings with mixing ingredients. 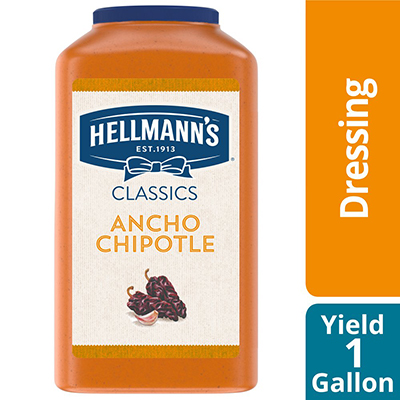 Hellmann's Real Sauces can liven up your current menu offerings. As part of Unilever, we understand consumers, your guests. We use this knowledge to help chefs and caterers keep up with people’s changing tastes.